In 2012 the castle was awarded the title “Maison des Illustres” (House of the Illustrious), a French heritage classification in tribute to one of the most exceptional women of the 20th century. To this day, the castle remains extraordinarily inhabited by the soul of the artist. Not everyone has the same colour, the same language, or the same customs, but they have the same heart, the same blood, and the same need for love. Josephine Baker was born an American on 3 June 1906 in Saint Louis, Missouri, U.S.A. Her painful childhood in a city marked by racial segregation was the start of her tireless fight for life. She fought racism, fought for freedom, for France, for equality, for love, for her children! How many battles? A smiling, cheerful little girl, she never stopped achieving her dreams and trying to help others achieve theirs. 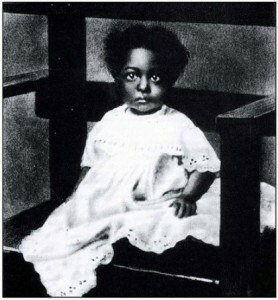 Her American mother Carrie MacDonald was black, and her father whom she never knew may have been of Spanish extraction. He never acknowledged Josephine, who was always obsessed by the fact that she was “neither black nor white”. Josephine lived in poverty with her mother, brother and two sisters. At a very young age, her mother placed her with a “white” family so she could work and bring in some money. These periods of deep poverty ended up considerably strengthening the character of the little “Tumpie” who was already looking for ways to leave the family nest. Passionate about dance, she thought up and organized shows for her friends. Her plucky personality soon drove her onto the stage. Initially a dresser with the Booker Washington Theatre Company, one day she stood in for a sick dancer and that was the start of a great artistic adventure. At the age of 14yrs, she won her first billing at the Saint Louis Theatre. Her painful childhood in a city marked by racial segregation was the start of her tireless fight for life. She quickly realized that her passion for dance could become the centre of her life, propelling her to better days: she ran away from her family and a difficult mother to pursue the life of a true artist. From the age of 14 to 18 she took on lots of artistic adventures travelling between Chicago and New York. It was in New York that she was signed up along with all her friends in the troupe, for a big Review in Paris! They embarked for the French capital in 1925 with some trepidation. A dancer with a dazzling freshness. 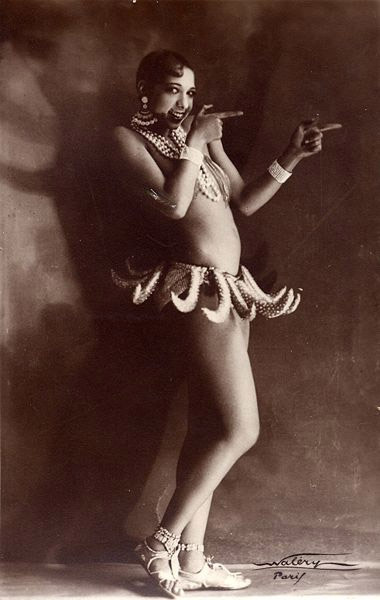 The “Revue Nègre” played to packed houses at the Théâtre des Champs-Elysées where Josephine pranced and scandalized contemporaries: nearly naked on stage, she danced to the rhythm of tambourines in a grass skirt! In doing so she was mocking whites and their colonial attitudes, as France, although less racist than the United States, nevertheless had a long way to go in their treatment of coloured people and their acceptance into society. After some hundred performances in France and abroad, Josephine broke her contract and agreed to sign up for the first time ever with the Folies Bergère, for a Review where she played one of the leading roles. In “La Folie du Jour”, she wore pink feathers and a belt made of bananas! You can see the belt displayed in the Château (one of the models of the era). Josephine devoted 1930 to becoming a singer. Wanting to be more than just a dancer, she captured Parisian hearts with her famous song “J’ai deux amours » [« I have two loves »]. It was a great success and the money started rolling in. It was in this period that she began to show great generosity (donating to charities, Paris hospitals, schools, and children in particular). She opened a cabaret “Chez Joséphine » and continued to sign fabulous contracts with Casino de Paris and the Folies Bergère. Eventually, the most desirable bachelorette in France found her Prince Charming: she married Jean Lion, a Jewish French industrialist, adopting his French nationality in 1938. Seeing no future together, however, the marriage was short-lived, although it allowed Josephine’s husband and his family to flee to the United States in the early days of the war, Josephine saving them from the death camps. Unfortunately a little-known period of Josephine’s life! She played an active part in the resistance. A French citizen by her marriage to Jean Lion in 1937, Josephine was recruited in 1939 by the Free French Forces. She was a cover for Captain Abtey, the head of military counter-espionage in Paris, thanks to her international reputation which allowed to her to move around freely and help refugees leave the country. At official soirees, she became an informant and courier and her music acts also allowed coded messages to be sent. Sent on a mission to Morocco, she entertained French and Allied troops stationed in North Africa, singing for free despite serious health problems. Josephine fought for France on many occasions, risking her own life. It was not until 1961 that she was awarded the Legion of Honour by Général Valin – at Château de Milandes. Josephine took every opportunity and used her fame to fight the racism still omnipresent at the end of the war. For her, there was only one race: the « human race”. 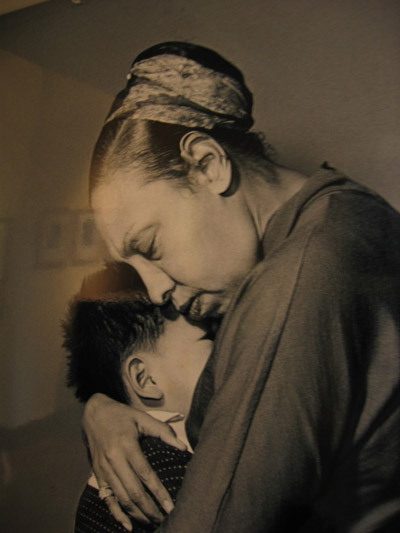 Feeling impelled by a mission to fight racism, she created her « Global Village” at Château des Milandes and wrote many works, including « Mon Sang dans tes veines » [My Blood in Your Veins], a reflection on the injustice of racial discrimination. 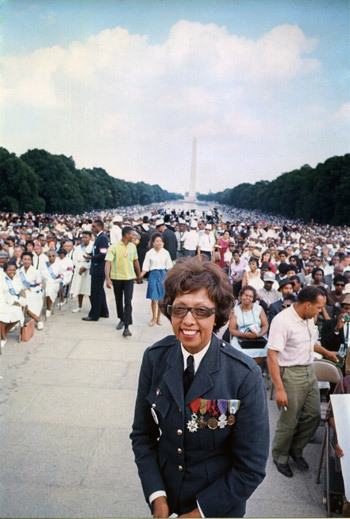 Josephine Baker was the only woman to speak at the Washington March alongside Martin Luther King in 1963. In 1947 she married Jo Bouillon, a famous orchestra conductor, in the chapel at Château des Milandes. They first met in 1933 at a gala in Belgium. They crossed paths again during the second world war when Jo agreed to participate in a charity tour that Josephine had organized. 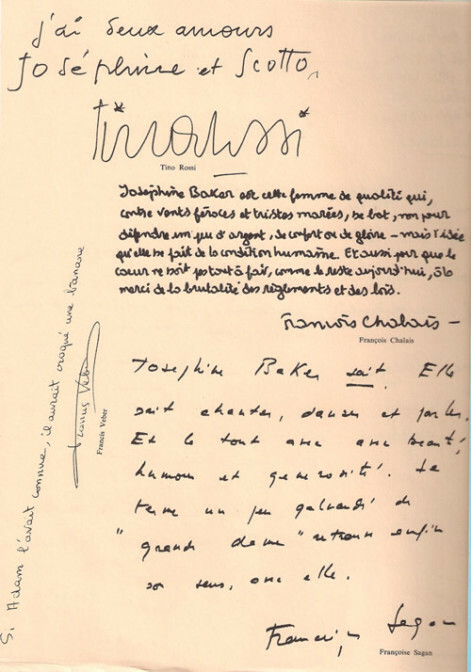 The two shared the same dream to found a “Global Village, the Capital of Universal Fraternity” to show the whole world that children of different nationalities and different religions could live together in peace. Josephine’s love for children was inexhaustible, to the point that, once back from her tours, she immediately launched into making Milandes a paradise for children in need, and especially those in need of love. Who could ever refuse her? All her children were adopted, from 1955. First 2, then 6, then 8, and finally 12 children of different nationalities and religions : Akio (Korean), Janot (Japanese), Jari (Finnish), Luis (Colombian), Marianne and Brahim (North African), Moïse (Jewish French), Jean-Claude and Noël (French), Koffi (Ivory Coast), Mara (Venezuelan), and Stellina (Moroccan). Her children together formed the « Rainbow Tribe », all for one and one for all, come what may. Initially, things went well: every child had everything it needed, was spoiled by a nurse, dressed like little angels, living in a plush, peaceful and loving environment. Akio remembers magical Christmases, the Château too small to accommodate all their friends and presents, a massive Christmas tree in the master hall. Josephine created a school catchment for her children and those in neighbouring areas. They went to Castelnaud School but at the Château a tutor also taught them the culture of their country. The 1950s were very happy years for the whole tribe, with an attentive father and mother. Jo Bouillon was tasked with running the fabulous Milandes tourist complex, and strove to contain the star’s increasingly unrealistic ambitions. Unfortunately, the foreseeable seeds of failure put an end to the happiness. Too generous and certainly too naive, Josephine was useless at managing a business. In addition to a tendency to overspend, due to her tough life, Josephine was defrauded by unscrupulous contractors making her pay the same bills many times over – plus her limitless generosity – pushing her into heavy debt. When Jo Bouillon left Milandes for other horizons, he left Josephine crippled by debt but still determined to continue her Global Village! A mother’s love for one of her children: She was first and foremost a Mum. In 1964, the Château was put up for auction. It had been rescued from bankruptcy proceedings by the intervention of Brigitte Bardot who launched an appeal to the people of France. Despite all efforts, the situation worsened. In 1968 the Château was again put into administration to be sold to the highest bidder. Josephine was on tour when she learned that the new owner had put the property up for investment. So she decided to lay siege to the Château and barricaded herself in the kitchen. Unfortunately, the new owner’s henchmen had no scruples and booted her out of the property. Weakened and in shock, she was taken to Périgord hospital. This tragic episode made a lasting impression on the artist, who declared that France had let her down. At the age of 62 she settled in Roque Brune on the Côte d’Azur with the help of Princess Grace of Monaco. To pay off her debts, Josephine went back on stage. In 1974, in recognition of her 54-year career, André Levasseur offered her a lifetime membership in the Sporting Club of Monaco. 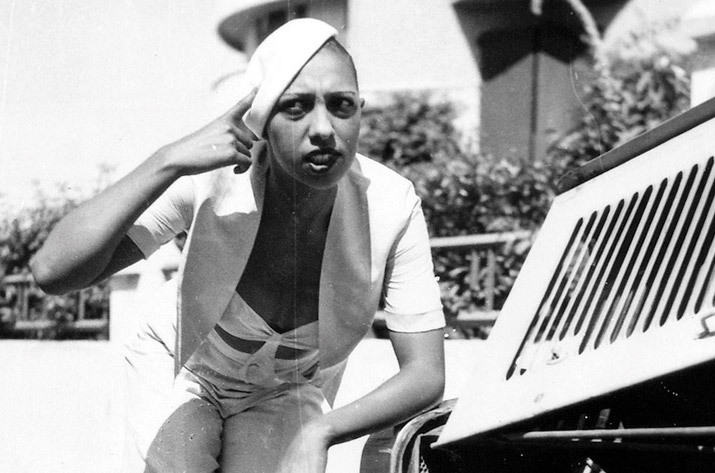 The Red Cross Ball organized for the Principality of Monaco allowed Josephine Baker to regain her status as a star. 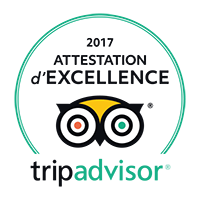 The show was put on at the Bobino Theater in Paris and was a great hit. It traced her entire career as an artist, the good times as well as bad. But the triumph did not last, Josephine was exhausted. After a few performances, she was found unresponsive in her apartment in Paris. Moved urgently to Salpetrière, she was pronounced dead at 5:30am on 12 April 1975 from a cerebral hemorrhage. Her funeral was held at La Madeleine on 15 April 1975 and she was buried in Monaco. Princess Grace of Monaco arranged for her to be moved to a burial vault on 2 October 1975. In 1975, with the eldest Bouillon sibling 21 years old, some of the children decided to join their father in Argentina, the others remaining in Paris and sharing an apartment with Jo Bouillon’s niece. 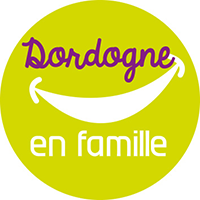 The now 11 children, after the death of Moïse, occasionally return to Milandes with always an unforgettable memory of their mother. Extrait du programme de son dernier spectacle à Bobino 1975.